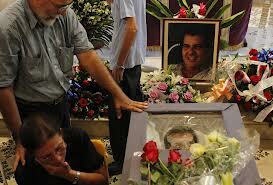 A few years ago I accompanied a friend from the Basque Country to the home of Oswaldo Payá. I left him nearby so as not to call attention to ourselves, because Payá’s house was always under heavy surveillance. The Basque wanted to do an interview with him and had already arranged the appointment. It was to be two hours. We agreed I would collect him at the same place and take him directly to the airport. When I returned the Basque was nowhere to be found. I waited half an hour. Then I began to worry. First for his person, and then for the departure of the plane and the loss of the ticket. When I’d waited an hour I began to ask where Payá’s house was. Finally I found the address and leaving the car two blocks away, I approached the house. It was close to ten at night. I knocked softly so as not to frighten him. Payá was the one who opened the door, and after greeting him and understanding that he wasn’t afraid, I explained. He assured me the Basque had been there exactly two hours, and he had told him they would be waiting. He told me this had happened on several occasions, and later his visitors showed up at Villa Marista (headquarters of Cuban State Security). He confessed he was getting worried, and gave me his phone number to let him know as soon as I had any news of the whereabouts of the Basque. I returned to the agreed upon corner. My friend had not arrived. It was the corner of the Children’s Hospital at the Calzada of Cerro. The words were: “I will pick you up at the corner by the hospital.” I began to calculate that the hospital had four corners, and that I should make a circuit to assure myself that he wasn’t somewhere else. When I went to the back of the hospital, right in the middle of the block, at the entrance to the Emergency Room, there on the bench the Basque was seated, legs together. The image reminded me of my son when I would go to get him at daycare: He opened his arms and gave me a smile of total happiness. He was all nerves and told me that his legs had given out and that the light from the Emergency Room offered him a perfect hideout. He was determined to die sitting there if I didn’t appear, he told me, and we laughed. Then he was silent for a while. Only by listening to the simple testimony of a what one person had suffered, could we be made to believe all the horror that a totalitarian government is capable of inflicting on an entire people. We raced to the airport. Remembering Payá, I called him on the phone. He was still awake, waiting for the news. The man is safe, I said, he’s already on the plane. Thank God, Payá responded. He thanked me for the call and after he hung up I wondered how a man who had suffered so much, who had been harassed and abused on so many occasions, including depriving him of his freedom, could still have so much love to give, even to strangers. Then I knew it was his faith: it was always his shield and his protection. Oswaldo Payá has died and left us, this man who with his “Varela Project” taught my generation and Cuba that freedom is possible. We were very young then and our idea was to shout liberty through literary works, which, from our naivete, we thought was the most direct path to democracy, and that this was the only possible weapon with which to fight. We have just left the parish where we were offering a last farewell to the body that accompanied him — because his spirit, as we all know, has remained with the Cuban people: his great love. We began to shout “Payá vive!” Payá lives. Our hands hurt from clapping while his coffin was carried from the entrance to the altar. The priest had to intervene to stop this show of grief and admiration that seemed, and is, interminable. Finally he was able to start the ceremony. As happens, the image that came to my mind was that of the Father of the Nation: Carlos Manuel de Céspedes, who suffered his dying moments similarly, the final minutes in San Lorenzo and that sad and solitary road on the outskirts of Bayamo. And to make matters worse, the mysterious vagaries of the convergence not only in their ideals but in geographic space. His wife, devastated, went to the microphone and asked for silence as they wished to pray. Then we started to pass by the coffin. One of the first who reached it was Monseñor Carlos Manuel de Céspedes. When I was able to approach the coffin I could see, in Payá’s face, the blows he suffered in the fatal fall, and also the permanent light shining in his image that will accompany him always. At 8:00 pm we participated in the funeral. Tomorrow* at 8:00 in the morning Cardinal Jaime Ortega will offer mass. Then, it’s said, one of the two survivors will give a press conference to describe what happened. Then we will know the truth.Until then we only have suspicions and conjectures. And anger which, hopefully, we know how to use to our advantage. *Translator’s note: This article was just posted, but the “tomorrow” that Ángel refers to is today. HAVANA, Cuba, June, http://www.cubanet.org – In the ’90s, the generation of the Novísimos (the Newest) brought to Cuban literature themes and narrative forms that marked a certain rupture with the previous generations. Angel Santiesteban, born in 1966, became one of the most emblematic creators of this time, not only for the prizes he won, but also for the acceptance he achieved with readers. 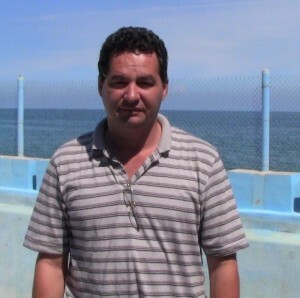 The son of a businessman and a nurse in Cienfuegos, Santiesteban studied in the “Camilitos” when he decided to begin a career as Commander of Tactical Troops. 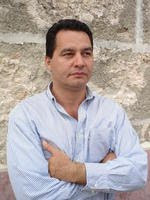 He then started going to night school at the Faculty of Letters, but, needing money for his family, he went to work as an assistant director at ICRT (Cuban Radio and Television Institute), at the time he was completing his studies as a film director at ICAIC (Cuban Institute on Cinematographic Arts and Industry). However, the urge to write imposed itself, and he abandoned his work to dedicate himself to writing. To his surprise, in 1989 he received an honorable mention with his third short story in the French Juan Rulfo contest. In 1990 he won the national literary workshop prize with his story, “South: Latitude 3” and later, in 1992, he sent a book with the same title to the Casa de Las Americas contest, which he won, but immediately the political police prohibited the jury from awarding him the prize. CUBANET: From your first publications it was evident that your subject matter was raw, modern and controversial, and besides the reader could think that you were relating personal experiences. Why did you choose these themes? ANGEL SANTIESTEBAN: I experienced a raw reality and my writing started to be raw. For example, the theme of Angola. As I came from a military world and aspired to be a soldier, I discovered that many feelings of the internationalist soldier coincided with those of the prisoners I knew in La Cabaña: They were far from home, their family and their environment; they were under pressure; they had profound sexual desires; they committed acts of indiscipline; they were given orders by the Army; they had to keep rigorous schedules. So behind this internationalist soldier that I describe is my experience as a prisoner. Occasionally some veteran of these wars asks me if I was in Angola, but I tell them that I was a prisoner and that I know these feelings. In addition, I have a brother who lived that experience. Before going he was the most rational person in the family, and he always gave good advice. When he returned he was the crazy person in the family. CN: Where do you feel most comfortable: in the short story, the novel, in your blog? AS: I feel most comfortable with short stories. Although it seems weird to say, the truth is that when I feel like writing, a short story comes out. Then I only have to fix some words. I’m short-winded. Writing a novel requires tremendous work. I suffer a lot, I procrastinate, I don’t want to continue. Furthermore, I can’t sit still, and a novel requires me to be more stable, more concentrated, and I’m very unconcentrated. As for the blog, I’m afraid of losing the discipline because it’s like a more refined journalistic chronicle. I’m not a journalist; I’m a writer, but sometimes life takes you to unexpected places. All in all, I started to write to give a voice to those who don’t know how or can’t do it. CN: Do you have favorite writers? Which ones have influenced your writing? AS: I constantly read and re-read Hemingway, Rulfo, Isaac Babel, Dostoyevsky. They are the ones I follow and the ones who from the beginning brought me the most. Although I should also note that Kafka always was there, sleeping (of course, I’m preparing a book of short stories about the absurd). From Cuba, I should mention Eduardo Heras León, who was the closest thing to a maestro writer I had. And, well, the writing of Virgilio Piñera has always been fundamental for me. CN: There’s no doubt that you were one of the most famous members of the Novísimos (the Newest). How do you see yourself with respect to your generation and, in general, with respect to present-day Cuban literature? AS: I believe that the Novísimos were a kind of family. I don’t know if it was so important as a literary movement, but as a movement of brotherhood, yes, it was. We all took a lot of care of one another. Now we’re dispersed, which is like a puzzle that you can’t put back together. Inside Cuban literature I feel alone, separated, in internal exile. And from the time I started my blog, I was no longer tolerable. They chewed up my writing, but they didn’t swallow it, and with my blog they spat out everything I was thinking inside. CN: Do you think Cuban intellectuals are obligated ethically to be critical of the Regime? AS: I believe they are obligated above all to follow their conscience. If you believe that you should defend Fidel Castro, defend him. If you have to defend the Revolution, defend it with your teeth. I don’t criticize that. What happens is that there is an amazing opportunism. In private there are those who are more against the Regime than I am. Extreme right. I have ended up feeling like a Leftist with these people. And later they do whatever they can to get a trip abroad. Their banner is opportunism, cynicism. They’re capable of saying in public that Cuba is the best, and later, in private and under their breath, they tell you that Fidel Castro should hurry up and die. CN: You have lived through almost unbelievable experiences — detentions, beatings, a shooting, very grave accusations, harassment, persecution, surveillance, without, properly speaking, being a dissident or an active opponent. To what do you attribute this obstinacy on the part of the political police? AS: I don’t even know how many political parties there are in Cuba. I don’t belong to any. I don’t go to any political meetings. I fight for the dreams of Cubans who want to live with dignity, in a democracy. This country cannot endure any more caudillismo. CN: You reported that once an old man asked you if you thought civilization existed outside this island and then confessed to you that he was tired of throwing bottles into the sea. Do you think that once you could have said the same thing? AS: I think Cubans who leave are the first to ignore these bottles. A large number of Cubans leave and begin buying and living what they couldn’t have before, disentangling themselves from the reality they left behind. Many say they are economic immigrants as if this didn’t make them political immigrants. If you leave for economic reasons it’s because your country has a bad economic administration. Furthermore, it’s terrible to know that you don’t have a way back. Sometimes I wonder how many bottles have to be launched and if they will continue being thrown into the water if many of the Cubans who leave don’t even look at them. However, Facebook is for me a tremendous thing, something that almost surpasses a blog, because it’s more alive, quicker. CN: This year is the official celebration of the centennial of the birth of Virgilio Piñera. What do you think is being done to honor him? AS: Virgilio Piñera merits a major homage. That a man like him has passed through this island should be for us a reason for perpetual pride. The terrible thing is that those who killed his spirit, who condemned him to fear, who did him so much harm, pretend now that they didn’t have any responsibility, that they acted without wanting to. His crime was being gay without being a revolutionary, and furthermore being a great writer. I’m happy that they published the most possible of his work. He deserves it, and Cubans deserve it also, especially the generations that don’t know him. But you can’t forget all the suffering they caused him. There is nothing that can erase that. CN: How do you see the present situation in Cuba? AS: There’s an impasse. The rhythm we had has slowed down. I think that’s the result of the Pope’s visit. I feel that nothing is happening, that we’re lost. I don’t see an immediate way out of our situation. CN: Why did you run in the last marathon in Havana with the image of Laura Pollán on your chest? AS: I ran several years in the Marabana, but this time I felt very hurt by her death, for having lost her as a leader. I thought that Laura was going to be the person who would topple the government, because of her vigor, her vitality, her courage that few are capable of. Perhaps she was God. Others say that they took her out. In any event we Cubans owe her for everything she did for us, and the least I could do was to wear her image on my chest so that people who don’t know her would ask who she was. It was my way of demonstrating to her, in Heaven or wherever she is, my gratitude for what she did, and to tell her that her sacrifice was not in vain. CN: Why do you continue living in this country when you probably could have a quieter life outside? AS: Someone once commented in my blog that surely I was one of those who has enough pull to go to the United States. However, I’ve traveled to the United States several times and never stayed. Precisely, they have not let me leave the country since I started the blog. I’ve had to post a bond for three years because of the stupid denouncements against me. On the other hand, leaving would be like surrendering. I believe that where you contribute, the more you are there. You can also contribute from abroad, but here you can contribute more directly. What I fear is to wear myself out in vain, now that I have sacrificed my writing. It’s been eight months without writing and that hurts me in my soul, because that’s the only justification I have for living. CN: How would you describe your life in this precise moment? AS: Right now I don’t know what’s going to happen with me or what I have to do. I don’t represent anything in the cultural world, which makes me feel very proud. I don’t want to interfere with them in anything, although I can’t return to publishing in Cuba. Luckily, this month an anthology of my stories is coming out in France. I also have published another anthology in Spain, Italy and Miami. There are professors and foreign academics who contact me because my writing interests them. As for the accusations against me, everything continues being very murky. I was with my lawyer at the public prosecutor’s office, and they told us that the file had been sent to the State District Attorney’s office. We went there, and they didn’t have it either, and finally they told us that a lieutenant colonel of Villa Marista had taken it. When we went there, they informed us that it wasn’t there either, that they didn’t know anything about it. Finally, we couldn’t learn where we could find the file. At least they had seen that they couldn’t shut me up. Since the time I began my blog, my life has changed completely, but I can tell you that If I had known from the beginning everything that I would go through, I would have done the same thing anyway, because now I feel freer in my conscience. When my last moment arrives, I’m going to feel happy because I did it. To have renounced the pleasures that they offered me to satisfy my conscience, for assuming my civic life, it was something I had to do. To not do it would have sickened me with disgust for myself, and then it would be better to be dead.